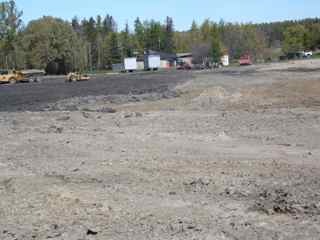 Bird’s Hill Provincial Park’s Beach Lake is getting a makeover. The beach was too crowded in summer, had developed swimmer’s itch and possibly some other health concerns. It also had some jutting points of land dividing the beach into three zones and creating a hazard for swimmers by having what looked like two nice diving platforms into very shallow water. These pylon-ish things were also obscuring the line of sight of the water safety patrol. And so the Lake is being enlarged by 1/4 to 1/3 (depending on how you measure it). 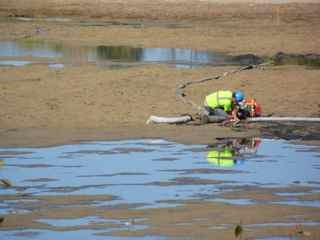 The lake basin is filled by a large number of artesian wells, some quite big, that send large amounts of water up into the basin. 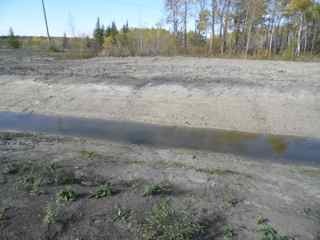 The water is then sent to Kingfisher Lake and eventually drains out into a creek that ends up dumping into the floodway of the Red River diversion and from there into the Red River. Controlling the flow of water into the basin was obviously problematic for the construction crew. They are managing to keep it dry enough to work but these pumps are everywhere being moved around where needed and one tractor appears to be dedicated to digging drainage trenches to dry areas so the crews could work. 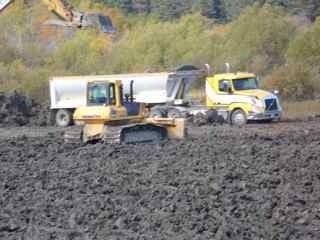 They are laying down a layer of thick Manitoba gumbo (which is basically heavy black clay) and then covering that with a layer of local sand. More pictures of this work in progress. It has been fascinating to come down to the beach every few days to see the progress. One of the more interesting features has been the diversion of the creek that drains the two lakes with the creation of new ditches and a new path. The tractors have worked both sides of the creek to widen it all the way to the edge of the park. Hopefully the heavy rain with flooding we saw this spring will be less of a problem in future years with the widening of the creek and the clearing of the bed. Bonus has been a long lovely pathway one can now walk beside the creek. There is a huge amount of wildlife that can be viewed by following the creek as they do. 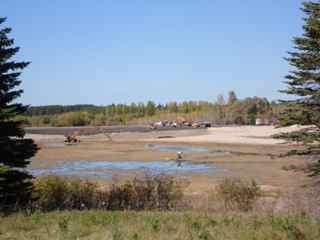 I was told another fact about the expansion (this is not “official”) that being a problem was sun screen and human pollutants making life difficult for the animals in Kingfisher Lake. Kingfisher Lake is stocked with trout and they haven’t been that successful even with a large oxygenating platform for winter. Part of the diversion is apparently (assuming the person who told me knows what they are talking about) is meant to get rid of this problem. I am not sure it is true, but it would certainly dilute out things like sunscreen that might otherwise concentrate in King Fisher Lake given the old drainage path. Kingfisher Lake not only has its own springs, but it also has a creek entering on one end opposite to these drainage ditches so it makes sense to separate the water flow. One thing we noticed was some nice steep hills being packed down by heavy machinery. These hills would be absolutely perfect for tobogganing in winter, something the park does not have. I don’t know if that is the plan but it sure would be nice for the kiddies if it is. 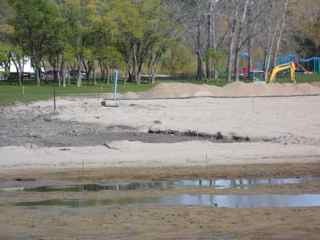 This entry was posted in bird watching, Bird's Hill Park Beach Lake Makeover, Retirement, RVing on October 3, 2014 by tumbleweedstumbling.